These 4-ingredient Cheesy Jalapeño Flautas are quick, easy, and crazy delicious! 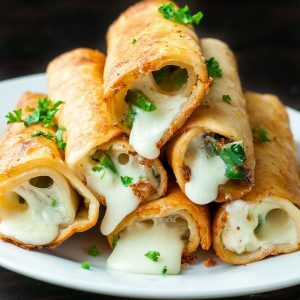 Slice each mozzarella stick lengthwise into 3-4 strips for even melting. Remove the stem and seeds from your jalapeños (or leave the seeds in for super spicy flautas) and cut lengthwise into thin strips. If preferred you can also dice them. We've made them both ways! Like your jalapeños crisp and crunchy? Keep them raw! Prefer them tender? Sauté for 2-3 minutes in a skillet. Paul prefers them softened and the extra step is crazy quick so I don't mind. In batches of 3 at a time, microwave tortillas between two paper towels for 30 seconds. Warm tortillas are the easiest to shape and won't crack <-- woot! Take one flour tortilla and add 3-4 strips of cheese and some jalapeño towards the edge of the tortilla and roll tightly. Secure the seam with a toothpick to prevent them from opening while cooking. Repeat for remaining tortillas. Try to remove any filling that spills out the side of the tortillas since it can overflow into your pan and burn. Heat oil in a medium frying pan (higher sides work best here) to medium-high (I kept mine just above halfway on the dial) adding an extra 1/4 cup if needed. Cook 3-4 at a time for about 2 minutes, using tongs to turn them over every 30 seconds or so. One golden on all sides, transfer to a stack of paper towels to drain off excess oil and further crisp the flautas. Serve with medium or spicy salsa for dipping! See post below for baking instructions if you'd prefer to bake instead of fry. Serving them up for guests? If you're doubling or tripling the recipe for a party, make them in small batches and pop them on a sheet pan in the oven (set to about 250 degrees F) to stay warm while you finish the remaining flautas. This way they're all hot, melty, and ready to serve!